"A shield with great strength. Absorbs 10% of the damage taken." Dropped by Mushroom XIII No. 2, No. 4, No. 6, No. 8, No. 10, and No. 12 (25%/85%). "A shield with tremendous strength. Absorbs 20% of damage taken." Dropped by Mushroom XIII No. 2, No. 6, No. 8, No. 10, and No. 12 (15%/90%). 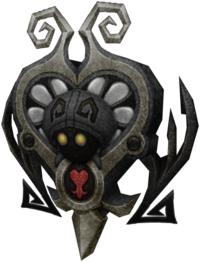 The Majestic Mushroom is a shield that can be wielded by Goofy in Kingdom Hearts II Final Mix. It can be upgraded to the Majestic Mushroom+. The Majestic Mushroom's main shape is that of a shortened Heartless emblem. The top of the heart displays two angular, curled horns. The horns and edges of the shield are grey. The shield's face is adorned by the head of one of the Mushroom XIII, with a black head, "hood", and arms with pitch-black, angular spirals on the hood, a pitch-black head, and yellow, seemingly glowing eyes. 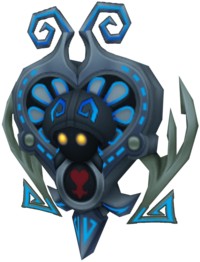 The shield's face behind the head is white with several black lines radiating out from behind the Heartless's head. 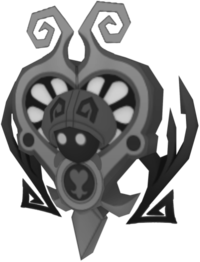 Just below this head is a black circle with a completely red silhouette of the Heartless emblem on it. There are also two black, wing-like additives on either of the shield's sides. ↑ The Mushroom XIII No. 2, No. 4, No. 6, No. 8, No. 10, and No. 12 drop a Majestic Mushroom 25% of the time if they are satisfied at rank C, and 85% of the time if they are satisfied at rank B. ↑ The Mushroom XIII No. 2, No. 6, No. 8, No. 10, and No. 12 drop a Majestic Mushroom+ 15% of the time if they are satisfied at rank B, and 90% of the time if they are satisfied at rank A. This page was last edited on 20 March 2019, at 21:50.